The Dixon United Methodist Church has a rich and varied musical program, led by Erin Brothers, Director of Music Ministry. A number of ensembles are available for both choral and instrumental offerings. Calling All Singers! The Fall Choir season begins August 30th! This Choir season promises to be one filled with eclectic and meaningful music. The choir always welcomes new voices and looks forward to a year full of making a joyful noise for all to hear. 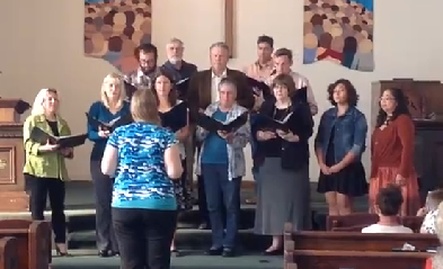 Rehearsals for the Adult Choir are Thursday evenings from 7:00 pm to 9:00 pm! The handbell Choir plays monthly in the 10 a.m. Sunday service. Adults and youth join together to produce inspiring bell anthems. No music experience necessary. All are welcome to join, learn and ring together. Rehearsals are Sunday afternoon at 12 pm! All kids are invited to sing in the Kid's Choir! Kids practice after Sunday school class and present their song during the 10:00 am service once a month. Children also participate in the Community Singing Time at the close of the 10 o'clock worship service. Participating in worship singing builds confidence for those who wish to join in the Kid's Choir. The recorder is a woodwind musical instrument , they are flutes with a whistle mouthpiece. The sound of the recorder is often described as clear and sweet, and has historically been associated with birds and shepherds. The recorder is a great beginner instrument to learn so no musical experience is necessary, just a willing spirit to learn! All are invited to take part in this new ensemble. Rehearsals are Sunday after fellowship time!